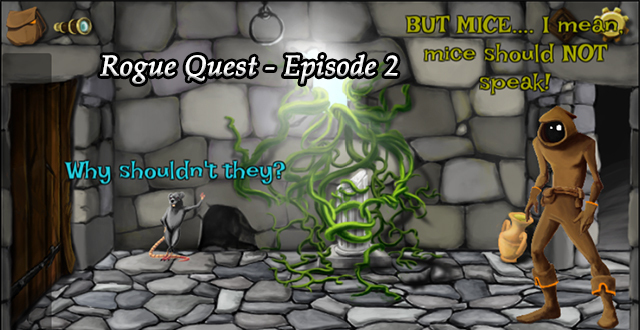 In the previous Rogue Quest, ExperaGameStudio led us through the expeditious adventures of Konrad Meridian as he stole the treasure from under the very Leech King's eyes! This time, you take over as Jheed, a novice adventurer looking to make a name for himself and join the Rogue's Guild. To do so, you'll have to help him explore and plunder the Tower of the Weeping Queen. Legend has it that the spirit of the Queen is trapped in the tower. By day she cries for her lost lover, and by night she is forced to kill any human life in her path! Discover Jheed's kindhearted side as he offers to help finally put the Queen's spirit to rest and help end her suffering. Along the way you'll meet characters like a talking mouse, a gnome who won't give his name, and a cannonball with a will of its own. This episode plays much like the previous one, with much smoother graphics, abandoning the pixel style of the first episode. Use your backpack in the top-left to access inventory and use objects on the environment. The binoculars icon nearby shows any interactive elements on the current screen. If you succeed, the Queen has promised you a hefty amount of treasure she has no need for in her next life. If you fail, well...the Rogue's Guild isn't exactly sending out a search party for you! Let's save the queen! Wait, I meant eliminate the rats! No no, we're here for treasure! You start in a room with a bunch of unusual things. Well, unusual for your first time as an adventurer. There's a pile of rocks on the floor and a puddle of rainwater on the floor, a chain that's both stuck and rusted by the entrance, and a locked door. Grab a rock from the pile, use your lockpick from your inventory on the door, and move on to the next room, after first climbing a flight of stairs, of course. You emerge from the right and must make your way through another locked door on the left. In this room, everything in this room is along the wall: a mousehole, an iron ring hanging from the ceiling, a small stone column covered by creeping vines, and an old amphora which you might as well take now. That mousehole looks a little suspicious. Perhaps you could close... no, that would be cruel. Speak to it instead. Turns out, there's a talking mouse in there willing to tell you everything about your quest: the queen's ghost, cursed to weep forever for her love; the gnome who cursed her, who remains in the tower to this day waiting for her change of heart; the dangerous nighttime, when the queen's song brings death to any humans she meets. The mouse will also happily tell you his story and listen to yours, but what you really want is a little help from him. So ask him for some help with the vines (after you click on the vines). He'll clear them, but you'd owe him some swiss cheese. Since you're an adventurer (right? ), this additional quest doesn't faze you, so you agree, and the mouse easily clears the vines in under five minutes. Take the heavy column. Use the oil and then the rock on the chain in the first room to take the chain. Since your amphora's now empty, fill it with the rainwater on the ground. Now use the chain on the iron ring in the second room, wrap the heavy column in it, and swing it through the door. And since you totally have no trouble lifting that thing, take the heavy column again. Pass through the stairwell on the left to go up. You emerge from the left and must make your way through a door on the right. This time, the door's bolted quite heavily. Probably for a good reason, but we don't need reason around here, we need treasure! Anyway, there's a broken fountain filled with sand in this room, and a bunch of melted candles on the floor, and wait, why is the floor clickable? Could there be some sort of secret beneath? Pour some rainwater on it, revealing three pressure plates. And since you really don't want that amphora to be empty, fill it yet again with the dust in the fountain. Do we have three heavy objects? Place the dusty amphora on a pressure plate, then the stone column, then click the last pressure plate to step on it. The wall breaks up. Go through the secret passage to the upstairs. Oops, the secret passage just caved in. Guess you could look for another way out. How about that convenient opening to the right? I'm sure that leads down to the downstairs. Anyway, that's not important right now. The next door to the left has been magically sealed, with options to Examine, Knock, Stare at, Tap, (click the red arrow) Push, Hold, or Maybe Later it. There are mysterious glyphs on the wall next to the window, allowing you to cast a vision of, you guessed it, A Tale Of Caos: Overture. And by vision, they mean Steam page, so let's not bother with that. There's an old cannon facing the window, with the option to move it or leave it. So you turn the barrel, which drops an explosive cannonball on the ground. You keep it since it didn't explode, and then you move the base, which ruins the floor. Among the ruins, you find some flint rocks, and decide to keep them. Examining the door gives you instructions to Kiss a princess, n...... this is too boring and irrelevant. But it also says that the capital letters are of capital importance, so let's just read those. K! H! T! S! P! P! So go ahead and KHTSPP that door, that is to say, knock, hold, stare at, tap, push and push it. The door opens, and you can make your way upward. The Weeping Queen is here, ready to tell you all about her story and her curse and the nightfall and how you really shouldn't be greedy about that treasure, in case you missed all of that earlier. But after you hear her story you get the option to offer her your help. It turns out that the Queen has learned some forbidden tricks, like learning the gnome's name to destroy him. But you'd have to challenge that pesky gnome, who is elusive and dangerous... and worth all of her treasure! If only famed adventurer Konrad were here to help you clear that threat from the tower basement. Ask about finding the gnome, and the Queen describes a hidden door right next to the tower entrance. So make your way down, and check out an unsolved puzzle on the way. Go back to level 3, and scratch at the candlewax to reach the candle wicks. Oh no, the four wicks are tangled. You could be stuck here till night just trying to untie those wicks. The idea of that makes you so mad you furiously click at the wicks in a random order. And that order is 31432. (Thanks, hint button.) Despite what the text may imply, this puzzle never resets, and so you get through it really quickly and stuff a lot of wick in your bag. Go back to the first screen with your cannonball (from the level 4 cannon) and your flint (from the level 4 floor) and your wick (from the level 3 candles) and use the wick on the cannonball and did you really just scratch "TNT" onto the surface of that thing? Use it on the wall to place it, and use the flint and COVER YOUR EARS IT'S GONNA BOOM! RIP headphone users, but you got the hidden passage open, so you can now make your way down to the basement. There's a lot of stuff in this room, but you might as well talk to the gnome right now. He refuses to tell you his name, of course. But you've learned from Konrad's playbook in Episode 1, so you're going to just challenge him straight to a test of... er... power! Yes, power! The gnome then counter-challenges you to bring him an emerald so pristine no human hand has touched it except yours. Do it before the sun sets, or another of his curses sets in and traps you forever! Now look around the room. There's a drain (doesn't look like one, but sure), barrels of red, yellow and blue paint, and shelves with a hacksaw, palette and very old cheese you can take. Oh, and your picklock is on the floor if you wanted it back. The mouse only takes swiss cheese. With the holes in it. Perhaps you could just poke some holes in it and call it a day. You don't have any pointy objects on you, so you'd have to make your own. Go back to level 3 and cut up that wooden door to get a wooden spike, and use that on the cheese to make it Swiss cheese. Give your "original" swiss cheese to the mouse. There, debt repaid! Say, that mouse does have a way with those dei ex machina, perhaps he's got a magical solution to your problem? Ask him about it, and sure enough, he has a single rare diamond that he's kept for ages just to trade for some swiss cheese. It's not an emerald, but close enough. Go back to the basement, use the palette on the blue and yellow paints in either order, and then use the diamond on the green palette to make a fake emerald. Use the emerald on the gnome, who has to tell you his name. Go back up to the Queen and tell her about the gnome and his name. She hides in your hood, and you can bring her downstairs to the gnome. Erm. You don't have a plan do you? Guess you'll just have to Wait. And then Wait again. And then it's time to mess up his spell. With the spell messed, the curse reversed, the queen freed, the treasure is all yours to take. So go back up to the top, and take the treasure for yourself, ending the game.